Another example: I didn’t like having to use the dreaded, phony 555 phone number in TV shows I produced. So, I started a service called We’ve Got Your Number (www.wevegotyournumber.tv) to acquire actual legally cleared phone numbers for use in entertainment. In Dexter, you will never see a 555 phone number. My friend Norm Epstein and I love word games. One day at lunch we kicked around an idea for a game, and when Norm proposed calling it Vowel Movement, I knew we had something. We mocked up the game using flash cards and a homemade board and refined the rules. We decided to take a shot at iOS development. Do you have any prior programming background (not necessarily c++) or did you start from scratch? I’m not a coder, and, as you implied above, don’t have the time to learn it. I know that a lot of people have had difficulties with coders delivering. Believe it or not, I found a great company to program Vowel Movement…a referral from my hair stylist. Very Hollywood, huh? She lead me to Chel Ramsey Productions in Brentwood Tennessee. Chel is an app producer who works with a programmer and an artist. Norm and I designed the game with crude drawings. We spent a lot of time thinking through and testing the rules. Then Chel (at a very reasonable cost) worked with us to turn it into the app you see now. Why “Vowel Movement”? Is there a particular reason you chose to develop a word game? I thought the name would set us apart from the myriad iOS games out there. I hope it’s intriguing enough to spark some attention. The day Vowel Movement was released, I was stunned to see there must have been a hundred other apps released that day. So, you need something to stand apart. As I mentioned, we just love word games. Especially Norm, who is great at it. He regularly scores over 300 in Scrabble. If you look at the leader board in Vowel Movement, you’ll see that he is always at the top (his game name is “The Bomp”). Any major snags encountered during the development process (e.g. Device compatibility, bugs, etc.)? The development process was great. We did encounter bugs and compatibility issues, but Chel fixed those as we found them without much fuss. What are your expectations about Vowel Movement’s performance, sales wise? Hopefully we dwarf Zynga…or get bought by them. Actually, I have no clue. 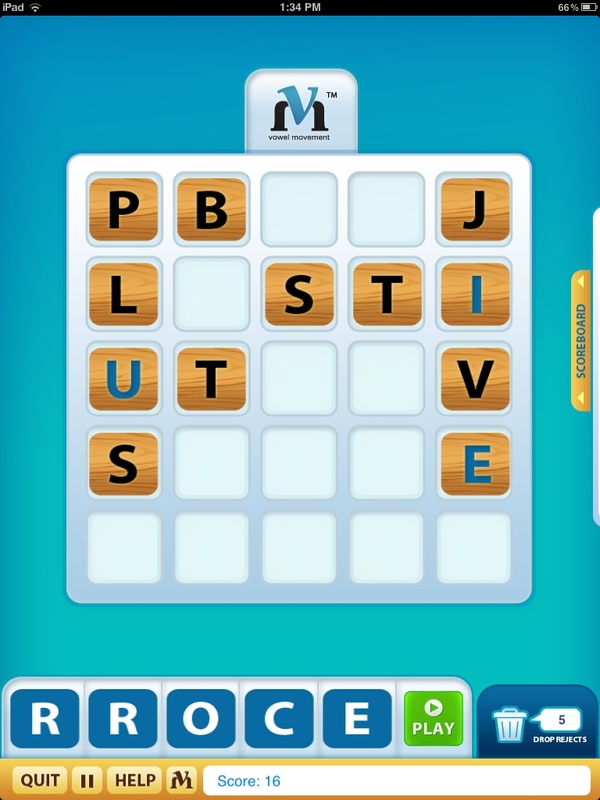 I don’t know how big the market is for word games that aren’t breakouts. I’m hoping we can make our investment back, and have some fun along the way. As Norm kept saying, if no one buys it, at least we’ll have a great game to play for ourselves. Any other app development plans in the pipeline (if you’re at liberty to disclose, that is)? At the moment, we have a lot that we’d like to do to improve Vowel Movement before we move on to others. It needs sound, and I’d like to offer a two player option. Right now, it’s a one person game, although you can challenge your friends to beat your score. What do you think are the important factors to consider if you want to go into app development? I know that in TV and film, the rule is always to make a product that you would personally want to see…don’t try to second guess what the audience wants. I apply that to app development. We made Vowel Movement because we found the game challenging, fun and addictive. Any advice to other developers? Apple has brought development to ordinary people at a reasonable cost. If you’re willing to put in the time and the energy, go for it. Mr. Lewis’ experiences and insights should serve as inspiration to anyone who’s interested in app development. Please do check out Vowel Movement when you can and stay tuned for a full review in the coming weeks! “Where is a will , there is a way” is absolutely correct.. One example is the above individual. Hats off to him .. Apple is really revolutionizing the mobile industry. The developers have now ample number of features on iOS platform those can be implemented to get a smart application at the end.